Philadelphia may get a chance to see some of Mother Nature's own spectacular fireworks late tonight/early tomorrow morning when a newly discovered meteor shower lights up the skies just in time to kick off Memorial Day Weekend. The meteor shower is called the Camelopardalids and will be caused when the Earth will pass through dust trails left by Comet 209P/Linear. Most meteor showers happen predictably at the same time each year as Earth passes through the same debris fields along its orbit, but this one is new. Scientists say that tonight's shower could easily be the best of the year, producing 100's of meteors per hour. It could also be just a few, since no one has see this one before. The weather forecast for tonight in Philadelphia is not ideal for star gazing. Right now it looks like we may have partly cloudy skies. The peak is expected to occur at 2 am on Saturday, but you may also see shooting stars flying 2 hours before and after that. 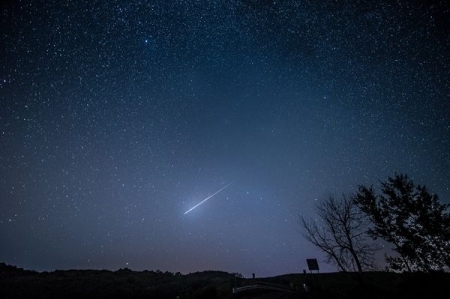 The best places to watch the meteor shower in the Philadelphia area are in any open space with a clear view of the sky. You should also get as far away from the city's lights as possible. All you need is a place to lie back and get comfortable, you'll be able see the shooting stars with your naked eye once they get adjusted to the dark. This shower will radiate from the North sky, but you should see meteors streaking across all parts. It is coming from the constellation Camelopardalis, a faint constellation near the North Star meaning "giraffe."